Over the week end we saw thousands of post on social media about Netflix movie 'Bird Box'. Your interest might definitely change if you saw the variety of responses that you read along the social media feeds. 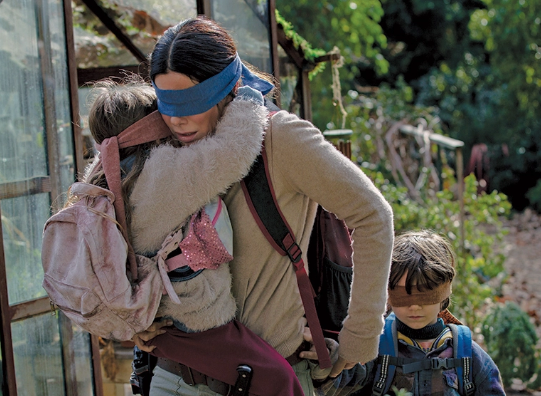 Netflix has announced earlier its record breaking number of views for Bird Box which garnered 45 million in just a week. Netflix twitted 45,037,125 accounts have seen the horror-thriller movie led by Sandra Bullock. We urge you to watch the movie with an open mind and not play along into what social media deems as a great movie based on blood scenes and horror. Try to watch it with a challenge to your daily life and consider a life lesson that can be applied to your life. Then we look more to social media the lesson learned people gotten from the viral movie and definitely we didn't failed. 1. The eyes are the window to the soul, which is why seeing was so important to the entity. The people that killed themselves from seeing the entity had so much baggage buried deep in their souls that they couldn't handle being confronted by it. 2. Only the "mentally ill" could see the entity and not die. This is because what the world deems as "crazy" isn't always true. These are people who deal with their people understand what they've been seeing by forcing them to "see"! 3. You have to be careful what you give attention to because your spirit can be tainted by what you watch! 4. Walk by faith, not by SIGHT. Sometimes it's best to enter a situation blind because it allows you to strengthen your other senses. 5. Don't trust everything you hear. The closer you are to your destination, the louder the opposition will be! 6. It's okay to let people in. We all need support in times of trouble. Don't be naive, and pay attention to the signs around you! You may share your life's lesson by sharing your comment below. It shows how strong love can be because tom took his life just to save malories life along with boy and girl.